Ste. Anne Parish de Detroit in Mexicantown is one of the city’s most historic church. Many local Catholics couldn’t believe the historic Notre Dame in Paris was burning. Ste. Anne’s program director Danielle Center watched the horror but also started thinking about keeping Ste. Anne safe. DETROIT (WXYZ) — Ste. Anne Parish de Detroit in Mexicantown is one of the city’s most historic church. Many local Catholics couldn’t believe the historic Notre Dame in Paris was burning. Ste. Anne’s program director Danielle Center watched the horror, but also started thinking about keeping Ste. Anne safe. “I got chills when the steeple fell,” she says. The church is the second oldest continuously operating Catholic parish in the country, almost as old as the city itself. That structure burnt down in a fire. The present church was built in 1886. 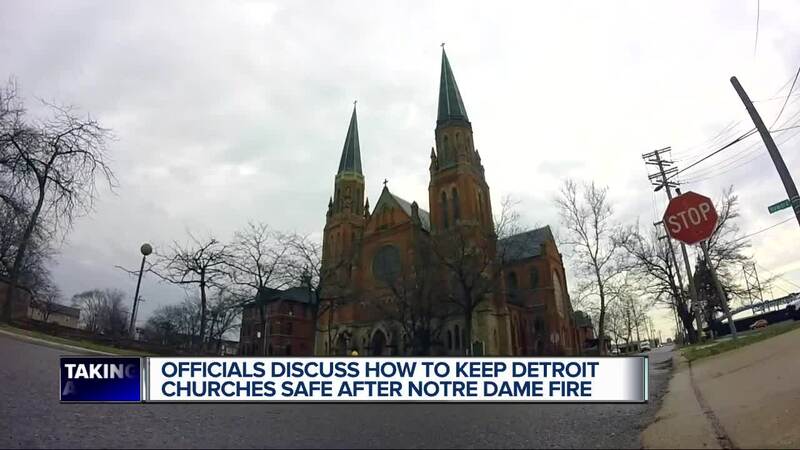 The Detroit Fire Department works with churches through a vigorous inspection program. Fornell believes church fires can be challenging due to the high ceilings and because Ste. Anne, like many churches, has plaster on wood which could spread a fire quickly. The only difference, if it is safe, firefighters will be trying to salvage historic items while battling the flames. Ste. Anne has many historic items that would be hard to salvage in the event of a fire, like the altar railing, artwork and stained glass windows. Some of their most treasured items are a statue of Ste. Anne and Mother Mary, and a relic of Ste Anne’s. “Sacred objects from a previous era, so we have part of Ste. Anne’s bones,” Center said.